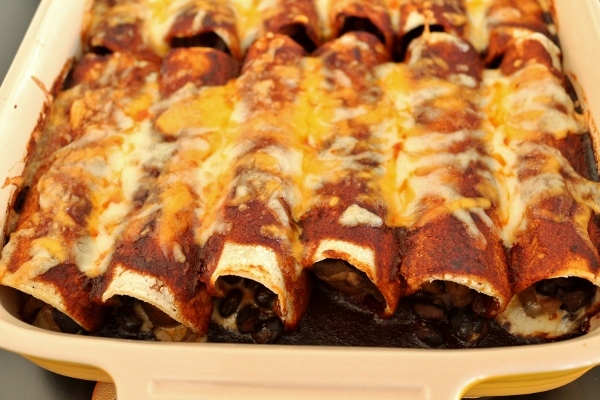 Mexican food is one of my favorite international cuisines. While I enjoy authentic preparations, I've also been known to dabble in the more Americanized Mexican fare that is common in the States. I most often make quesadillas, usually with refried beans, cheese, and pickled jalapeños tucked inside. I also enjoy making nachos, tacos, enchiladas, and more. One of my absolute favorites is enchiladas, and I tend to order those frequently in Mexican restaurants, but also very much enjoy making them myself. 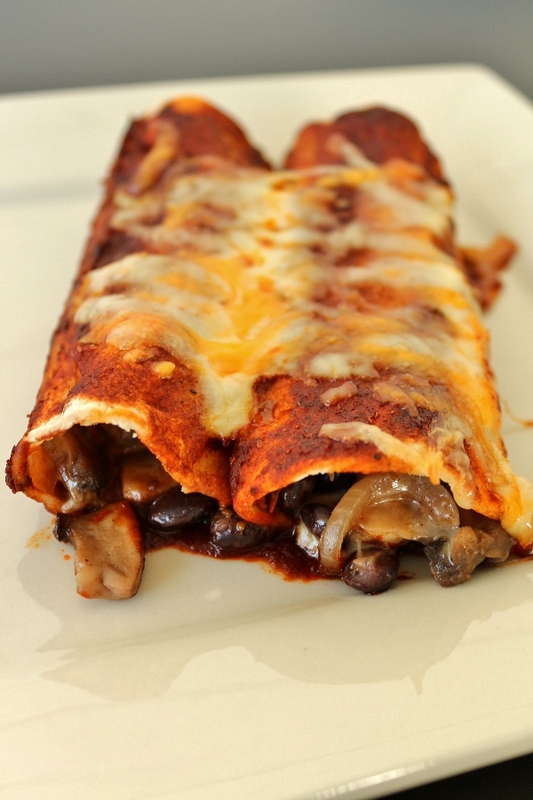 Earlier this year I made a very time consuming, but outstanding Mole Poblano, which I used in chicken enchiladas. 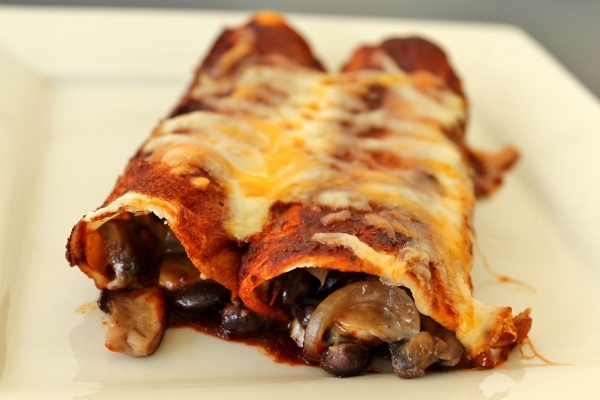 The recipe came from a wonderful single subject cookbook Salsas and Moles, which contains many other wonderful, and less time-consuming recipes as well. 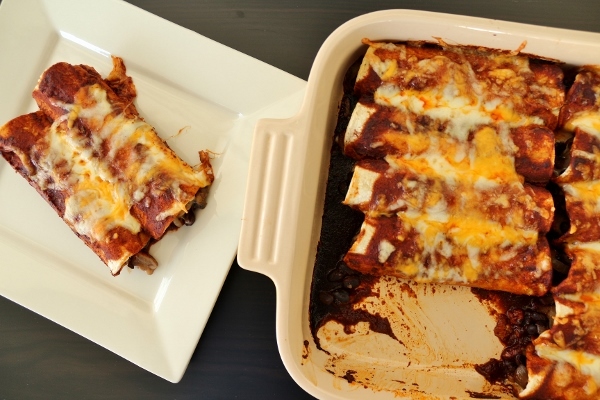 I was recently craving more homemade enchiladas, and this time decided to venture away from my typical chicken enchilada filling, which is very simple since it's basically just shredded cooked chicken breast, but I was looking for a change. 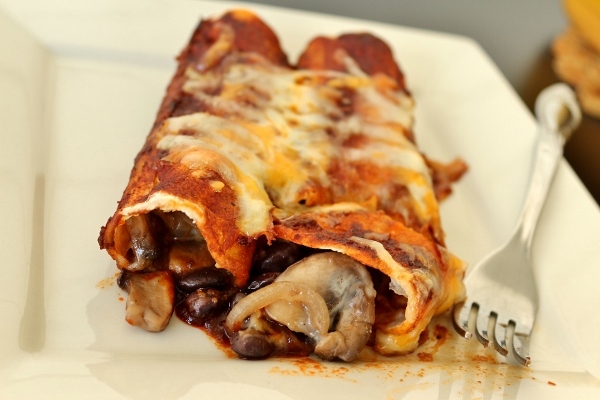 I concocted a vegetarian enchilada filling featuring sauteed mushrooms, onions, black beans, spices, and a bit of cheese to hold it all together. 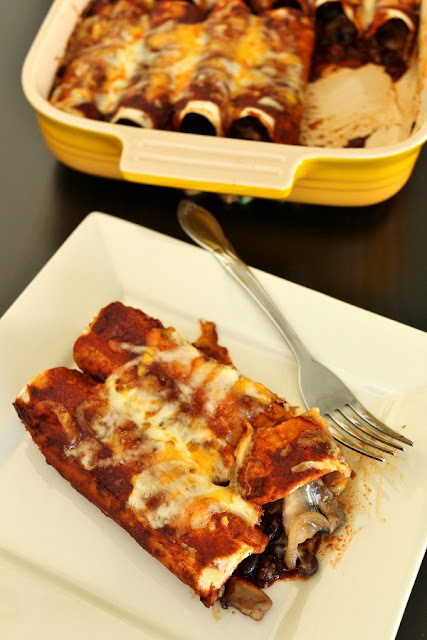 A traditional red enchilada sauce is most appropriate to pair with this filling, and I was able to try a very straight-forward and relatively quick recipe from the same book entitled Simplest Enchilada Sauce. It uses two varieties of dried chiles, ancho and guajillo peppers, lightly toasted and soaked in hot water to soften. They are then blended with garlic and fried with a bit of finely minced onion until thickened. Finished through a food mill to ensure smoothness, this smoky, yet relatively mild sauce is ready to go! Mine had a touch of bitterness, most likely because my ancho chiles were less than fresh (I have a small variety of dried chiles in my pantry, but don't get to use them very often), or I possibly toasted them a bit longer than necessary in my cast-iron pan. Regardless of that fact, I found the flavor to be complex and quite delightful with the umami flavors in the filling. If you omit the lard in the sauce, using vegetable oil instead (which is what I used), this dish is completely vegetarian. Although the original sauce recipes claims to yield 3 cups, I ended up with only 2 cups. 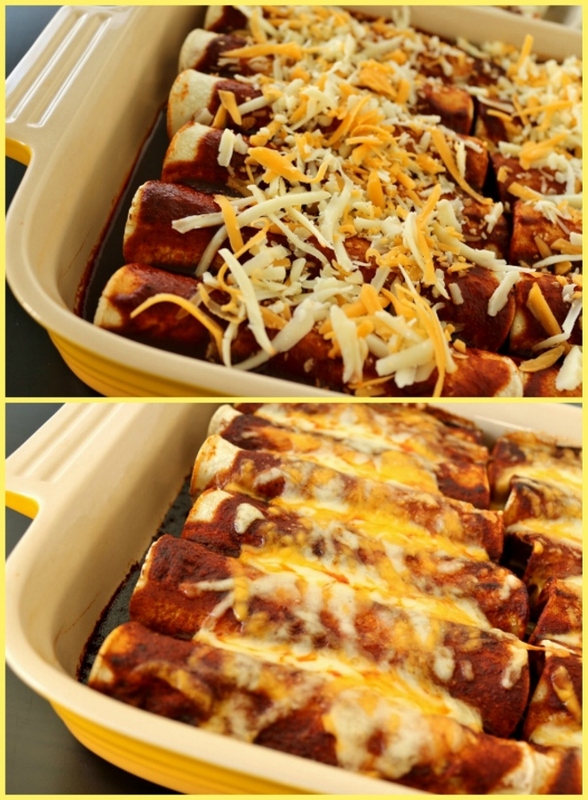 I used 1 cup for these enchiladas, and froze the other cup for a future batch. Heat the oil in a large saute pan over medium-high heat. 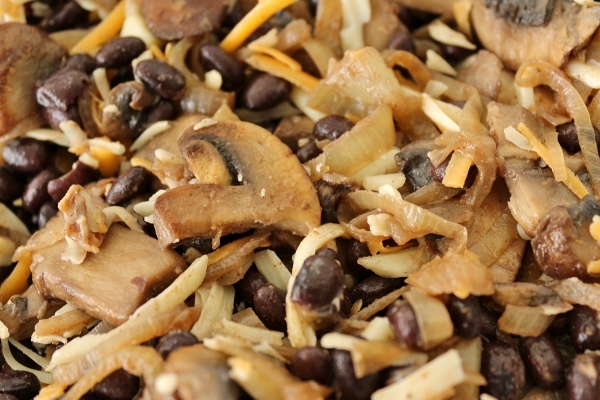 Add the mushrooms and onions and saute until softened and mushrooms are lightly golden. Add the black beans, cumin, coriander, and season to taste with salt. Saute for a few more minutes until beans are heated through to allow flavors to meld. Remove from the heat and cool completely. 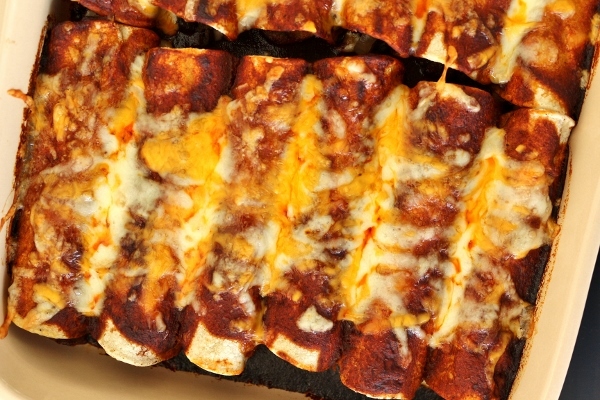 When cooled, mix in 3 ounces of the shredded cheese and set aside. Preheat oven to 400 degrees F and lightly grease a large baking dish. Gently warm tortillas so they are soft and pliable (I like to put them on a plate, cover with a damp paper towel, and microwave for about 10 to 15 seconds). Fill each corn tortilla with about 1/3 cup filling, rolling the tortilla carefully but tightly to encase filling. Set seam side down in the prepared baking dish. Repeat with remaining tortillas and filling. 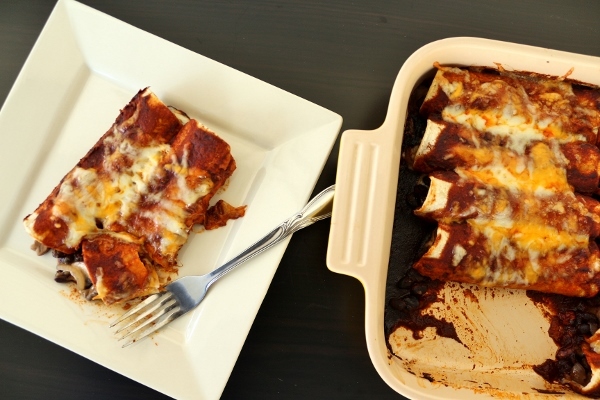 Spoon sauce over the enchiladas and top with the remaining 4 ounces shredded cheese. Bake 15 to 20 minutes, or until cheese is bubbly and edges are crusty. Serve immediately. Heat a large cast-iron skillet over high heat. Remove the stems from the chiles, cut a slit up one side of each, and remove the seeds. Open up flat. One at a time, press the opened chiles flat onto the hot skillet until blistered and light brown. Turn and repeat, being careful not to burn. Place the chiles in a small, deep bowl and add 2 cups of the hot water. Soak the chiles for 45 minutes, occasionally pressing them down into the water. Place the chiles and soaking liquid in a blender. Add the garlic and salt and run the blender on high speed for 2 to 3 minutes, until very smooth. In a 2-quart saucepan, heat the lard over medium heat. Add the onion and cook and stir until soft. Add the chiles. It will splatter, so have a lid or splatter screen ready. Fry the sauce for 7 minutes, stirring occasionally. Rinse the blender with the remaining 1 cup of hot water, add it to the salsa, and simmer for 10 minutes. If desired, strain through a food mill or coarse sieve. I like the salsa to be thick enough to cling, but you may thin with more water if desired. Serving Ideas: This is a true all purpose salsa. 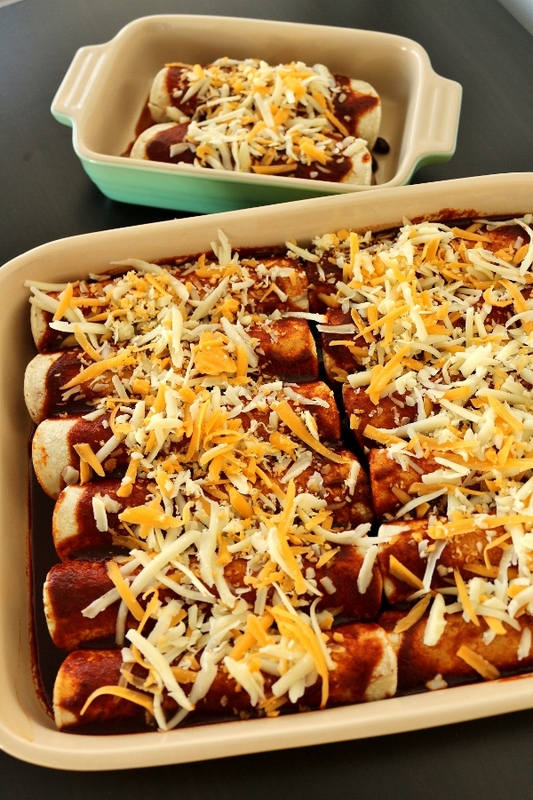 It is the classic sauce for enchiladas of all types: cheese, chicken, and especially beef. It is also used to make chilaquiles, cooked into beans, stirred into nopalitos, and added to many types of soups and stews. Mixed with shredded meats, it is a tamale filling and sauce. The uses are infinite.